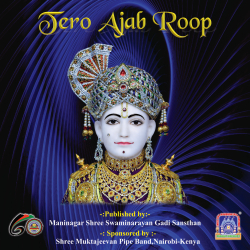 The CD of devotional songs, Tero Ajab Roop, was released on 23 December 2015, by Acharya Swamishree Maharaj during the occasion of Shree Muktajeevan Swamibapa Pipe Band Nairobi's sixtieth anniversary celebrations. The devotional songs describe the beauty and glory of Lord Shree Swaminarayan's divine and immensely enchanting Murti. The lyrics have been written by Sadguru Shree Premanand Swami, Gurudev Shree Muktajeevan Swamibapa and Sadguru Shashtri Shree Sarveshwardasji Swami, and the music composer is Surendra Bachchan.